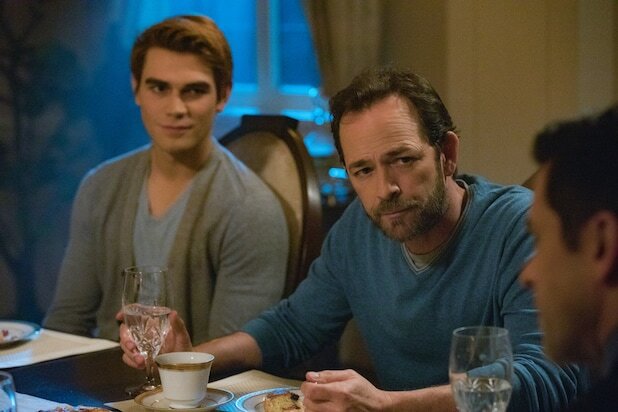 “Riverdale” will its first episode tonight since the death of star Luke Perry, who played Fred Andrews, the kind and loving father of The CW drama’s leading character, Archie (K.J. Apa). Showrunner Roberto Aguirre-Sacasa gave fans a hint at what they can expect when they tune in to see Perry on screen Wednesday night – two days after he died at the age of 52, following a “massive” stroke last week — which is yet another plot featuring Fred taking care of his boy. Production was shut down on “Riverdale” on both Monday and Tuesday after Perry’s death. Aguirre-Sacasa, fellow executive producers Greg Berlanti, Sarah Schechter and Jon Goldwater, along with studio Warner Bros. Television and network The CW released the below statement together on Monday. Perry had appeared in 52 of the 57 “Riverdale” episodes. The show, a dark take on the “Archie” comics, has already been renewed for Season 4. “Riverdale” airs Wednesdays at 8/7c on The CW.